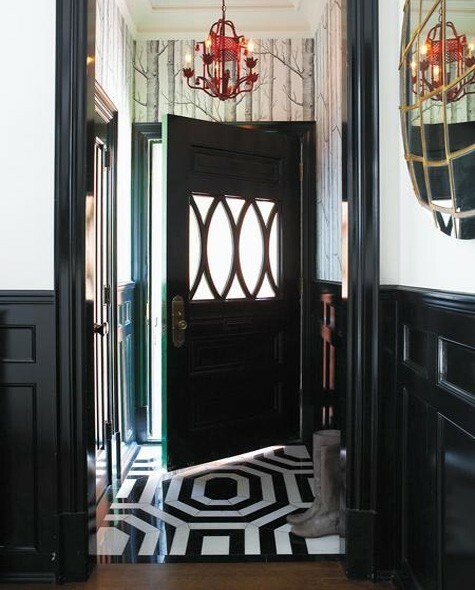 Black doors make a statement, albeit subtle and classic, can work with any style/decor and, whether gloss or matte, give a finished look. And boy, do I really like the crisp white trim and pediment on the door above, coupled with the grey paint, black door, and dark floors! Just some food for thought for you 🙂 Have a great weekend! Gorgeous, gorgeous photos! Thanks for sharing. You’ve inspired me to think about home decor this weekend. Cheers! Yay!! I love it that you’re inspired!! That’s it my doors are being painted black ! What an elegant look and who would have thought. Evidently you did and it is perfect for your home. May I have permission to copy into my blog the pics and of course credit given to you? Thank you. Love a touch of black when it comes to decorating – thanks for sharing:) Happy Saturday! i love them and all the chandeliers too. I have our front door painted black on the outside and I love it! Beautiful! I love black doors! I agree. I love how elegant back can be. It gives me some ideas for updating our kitchen which is all white but with horrible white counter tops. 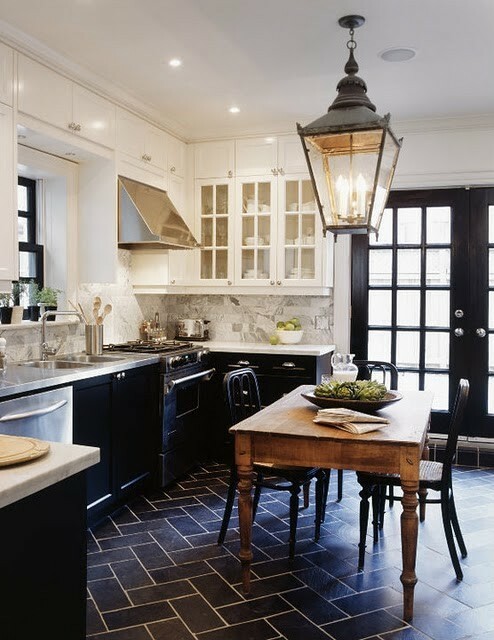 I like the kitchen shown with the black cupboards and black door. Our doors need to be painted. We learned that they never were merely a cheap primer. In a new house too! Well it was when my husband purchased the house 8 years ago, before we were married (as much would have changed or decorated differently had I a say in the purchase. I merely shake my head now as I didn’t even know him then). Don’t get me wrong I love our house, and we have managed woderfully to make it a home. I love your blog as it always puts great thoughts for improving ours. Thanks for sharing. They certainly make a statement! I especially like the contrast with the sky blue. Such an elegant choice. I read an article once by a designer who likes to include black touches in every room. I’ve never forgotten that. 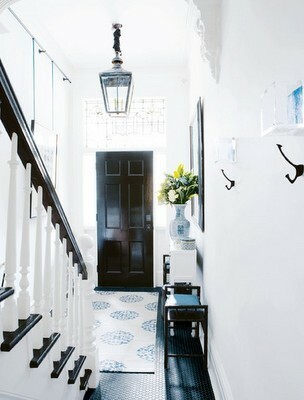 I think a little goes a long way, in the same way white trim can set off beautiful walls and floors. You have such taste and style! I always love your posts! That’s SO nice of you to say!! When there’s a lot of glass involved, I can handle it; otherwise, I think it’s a bit much. Although, when there’s matching stair railings or other furniture nearby, I gotta admit it works. LOVE the floor in pic 11 from the top, and the grey ion the last one picking out the pediment shape, too. I’ll take doors # 1, 5 & 8 for starters! Wonderful pictures. Black continues to be popular. It works best in large areas with high ceilings or on large entry’s. Wonderful blog. Keep up the good work. Love all the pix. 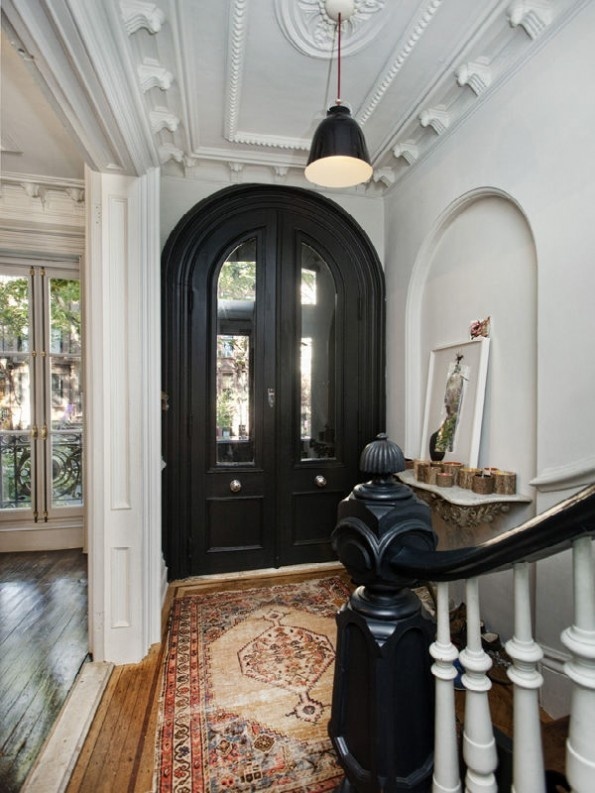 LOVE a black door…very nice indeed!! love it. very coco chanel, crisp & clean like a convent. I love the black doors! And I love your blog, gives me so many ideas for my own house. Thank you! I’m so glad that you’re able to translate these to your own home! I agree that black doors make a statement. I noticed that the ones that I liked also had a touch of black in the room which brought it together. You really need that balance. Great article! Great post! 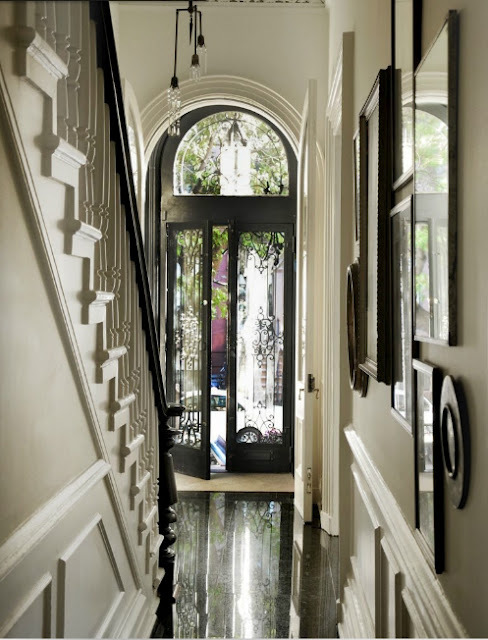 good entrance hall photos, to “make a statement” but naaaaa, it`s the “black and white” the “safe choice” homes are for living in! they should be warm and inviting! a rich blend of colours…. a place where everybody, friends, children etc can instantly feel comfortable.. very difficult to do… black on the outside door yes, No 10 Downing street, London, a case in point. Love that look & would do it today… if only Lola didn’t attack the front door every time we get a delivery. Painted the door to my bathroom a high gloss black a while ago, and I love it! If you’re thinking about it, I say go for it! 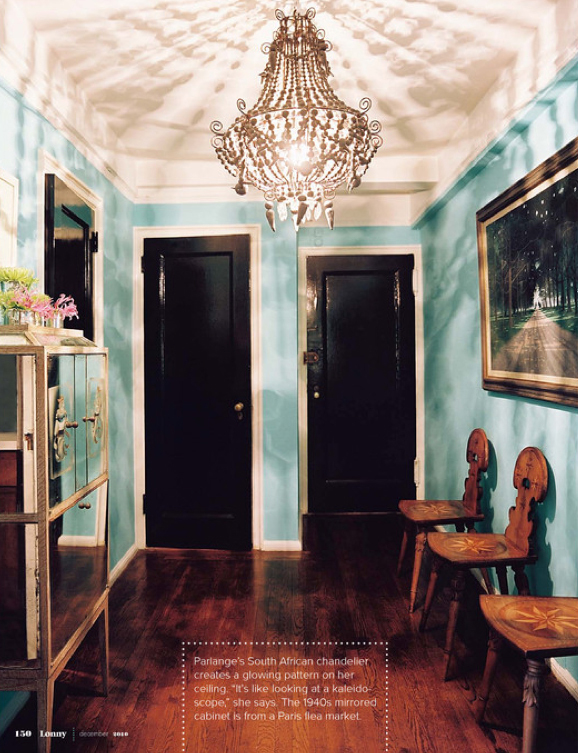 I literally have the painter coming tomorrow to paint my front door black, but I’ve been afraid of my choice…until now! I can’t believe the timing of this post, and how relieved I am. It’s going to be great. Thanks so much! 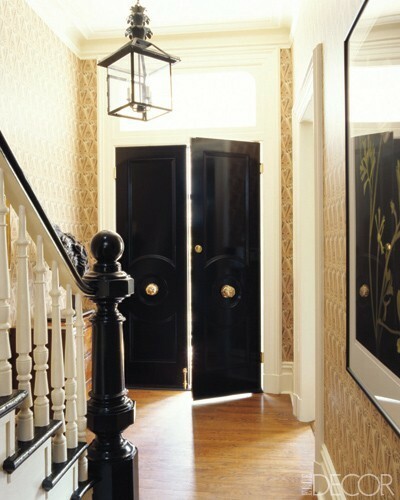 I also love black doors, the crispness and drama. Great post. Um, I LOVE all of these!!!! 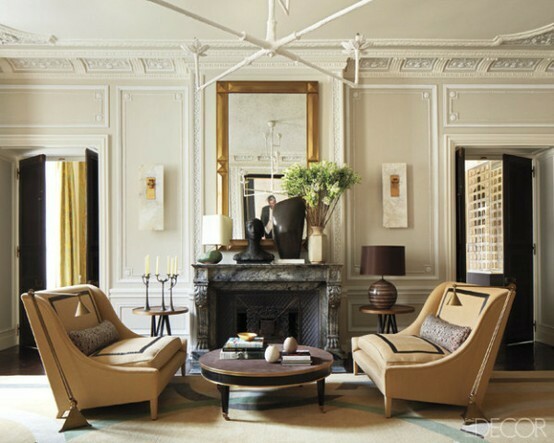 Black in interiors as in fashion is a grounding color. In all the photos except one, the interior colors used are white or greish, the eye has no relief with these colors, meaning it cannot rest on anything, therefore the color black is the resting color. Great selection of photos. I painted the outside of our old claw foot tub black and the pipes/feet gold. Looks so much better! Black can really make a room. Another great idea, you know the on drop ceilings? Keep the silver but paint the tiles black, looks amazing. I told my sister to try it in her basement before she tore them out. She did, loves it and saved them money by not having to change anything. Great pictures! I also think black doors really add a minimalist look to your home. Gorgeous! 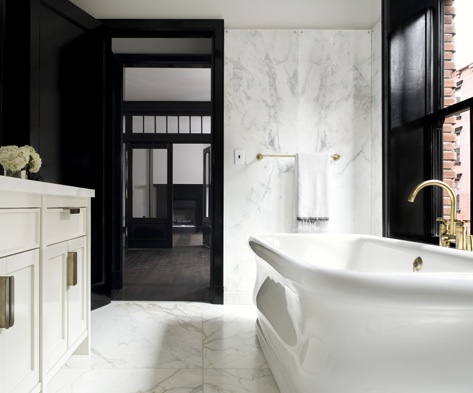 Such inspiring photos — the contrast of the black doors on the white interiors is stunning.